Substituting Library Resources for Textbooks: What Can You Do? Begin with your syllabus and consider your learning objectives for each component of the course. Are there library resources such as eJournals or eBooks that could be combined as a substitute for textbooks? For advanced classes, consider having your students find the course materials as part of developing their research and information literacy skills within your discipline. You can search your library's website (links in the sidebar on the right) to locate the online, full text resources to which your library subscribes. Make an appointment with one your library’s reference and instructional librarians. Many CSU libraries have liaisons for each college, school, or even department on campus. 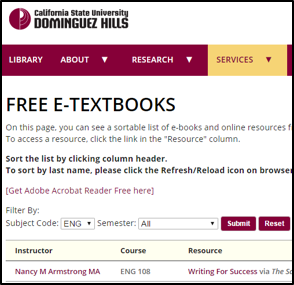 Your librarian can guide you to finding the best materials using the power databases and discovery tools available in the library, and often can offer best practices on how to include those materials in your online course. 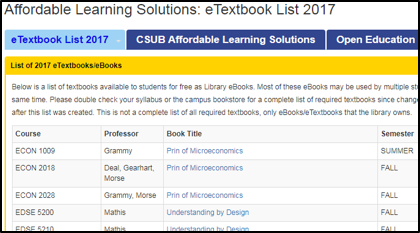 To learn if your campus library has created a similar resource, contact your AL$ Campus Coordinator. 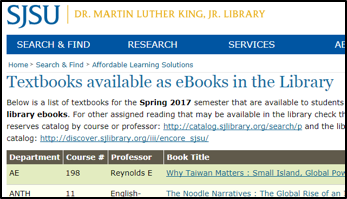 Your library has powerful tools for finding eBooks, electronic journal articles, and other digital resources in your library’s collection that can become course materials for your students -- all at no cost to them. We now have a quick and easy way for you to discover these online library resources and arrange them into a reading list for your students, providing simple, seamless access for students both on- and off-campus. And best of all, you can do that all without having to leave your learning management system. Contact als@cdl.edu for more information. If students are going to be successful using digital content and searching for quality educational resources, they need to practice the requisite skills. For more information see the ICT LIteracy Teaching Commons.